Spinach, fenugreek and cilantro are mixed with besan and made into batter with yogurt. The mixture is then dropped into hot oil and deep fried till brown in color. 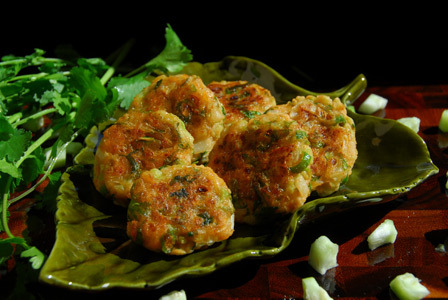 Serve mixed greens fritters as a tea time snack or with any pickle rice. Makes: around 10 Mixed Greens Fritters. Wash and roughly chop spinach and cilantro leaves. Separate and thoroughly wash fenugreek leaves. In a mixing bowl, combine all the ingredients and make it into a thick pourable batter. Use few drops of water if necessary. Heat oil in deep frying pan on medium low heat. Drop small lime sized portions of the prepared batter into hot oil. Let the bhaji turn brown on all sides. Remove the bhaji onto a absorbent paper. Repeat the same with any remaining batter. Serve mixed greens fritters immediately. Notes: Make sure to deep fry on a medium low heat to allow insides of the fritters to cook. 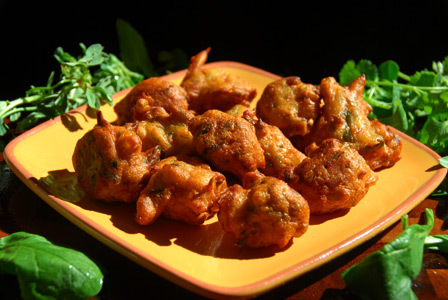 Suggestions: If the fritters are not cooked properly, drop them back into oil and deep fry on low heat till done. Variations: You can also add soaked sago to the batter if you wish. Other Names: Aku Kura Punukulu, Mixed Greens Fritters, Mixed Greens Bhaji. Ullipaya Karam tho Vankaya Bajjilu. Raw onion is ground into coarse paste with red chile and cumin seeds. Indian baby eggplants are stuffed with the onion red chile mixture. 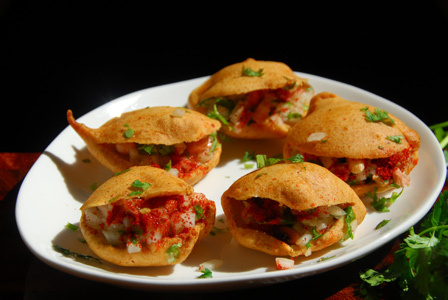 They are then dipped in thick besan batter and deep fried in hot oil till insides is completely cooked and outside is golden in color. Makes: 3 Deep Fried Eggplants. Wash and pat dry eggplants. Remove stem, and break red chile into pieces. Grind chopped onion, red chiles, cumin seeds and salt together into coarse paste without adding any water. Slit each eggplant vertically twice leaving its stem intact. Stuff each eggplant with the a tbsp of prepared onion stuffing and keep aside. 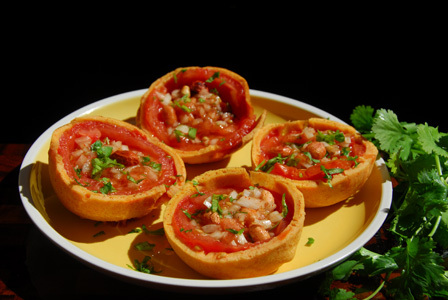 In a mixing bowl, mix together besan, soda bi carb, salt together with enough water into smooth tight batter. Heat oil in a frying pan on low medium heat and let oil get hot. Dip each stuffed eggplant into the besan mixture and slowly drop into hot oil. Fry on both sides until eggplant turns into light golden color (around 10 minutes). Remove onto absorbent paper and repeat the same with remaining eggplants. 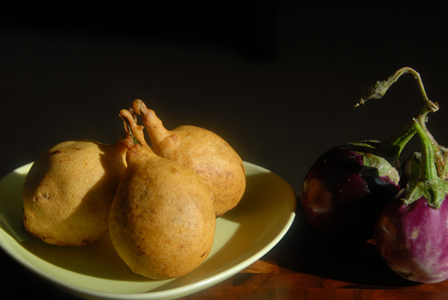 Serve deep fried eggplant with pickle rice or as a snack. Notes: Make sure to fry the eggplants on low heat for a long time. Suggestions: If insides of the eggplant are not cooked properly, deep fry the remaining on medium low heat until done. If the besan batter is not thick enough, it doesn’t coat the eggplants properly. If the batter is too thick, then the eggplants take lot of time to cook. Variations: Also add a tsp of thick tamarind extract to the onion mixture if you wish. Other Names: Deep Fried Eggplant, Ullipaya Karam tho Vankaya Bajjilu. Ridge gourd is chopped and salted. Later the salted ridge gourd is squeezed and mixed with rice flour and other spices and made into small patties. The patties are then either shallow fried on deep fried until golden brown in color. These are generally served with rice. Makes: around 6 Ridge Gourd Patties. Remove ends, remove skin and wash the ridge gourd. Finely chop the ridge gourd (around 2 Cups). Sprinkle a tsp of salt and leave chopped ridge gourd aside for 15 – 20 minutes. Then squeeze the chopped ridge gourd between hands to remove water. In a mixing bowl, add squeezed ridge gourd, rice flour, chopped onion, green chiles, red chile powder, cilantro and salt (if necessary). Stir and slightly mash the mixture to form a very soft dough. Add little bit of water if necessary. Take small lemon sized portion out of the mixture and flatten it on the palm to form a small disc. Repeat the same with remaining mixture and keep all the flattened rigde gourd discs aside. Heat a flat pan on low – medium heat. Carefully arrange the ridge gourd discs on hot pan one by one. Drizzle oil on each patty and let them fry on both sides until light golden brown in color. Remove turai patties onto absorbent paper. Serve ridge gourd patties with hot steamed rice or steamed rice mixed with pickle. Notes: Make sure not to add too much rice flour. Suggestions: If the patties are not cooked properly, put them back on heat and cook on low flame until inside cooks and outside turns crisp. Variations: You can also add other kinda of flours to bind the ridge gourd mixture. The ridge gourd patties can also be deep fried. Other Names: Ridge Gourd Patties, Beerakaya Vadiyalu.